Dental fear, also known as dentophobia is the fear of going to the dentist for various reasons, commonly because of dental tools and procedures. Dental fear may differ from patient to patient. The anxiety can range from general to severe nervousness. Because of this, people who suffer from such fear may compromise their oral wellbeing and even general health. Some signs of dental phobia include sleeping difficulties the night before the appointment, escalation of panic while inside the dental office, and extreme discomfort when tools are placed in the mouth during the treatment. On the brighter side, there are still many ways a person can cope up with dental phobia. The dental team may also help their patients in managing the anxiety as long as the patient cooperates. Some of these aids involve psychological assistance including the help of technology and gadgets. If these options don’t actually work, the dentist may apply the sedation, which is usually provided in invasive treatments. Sedation may range from pills to general anaesthesia and are used to help the patient feel relaxed and comfortable. It is important that one shouldn’t be overpowered by own fear. Communicating with your dentist helps you significantly to build trust in your dentist’s expertise and skills. 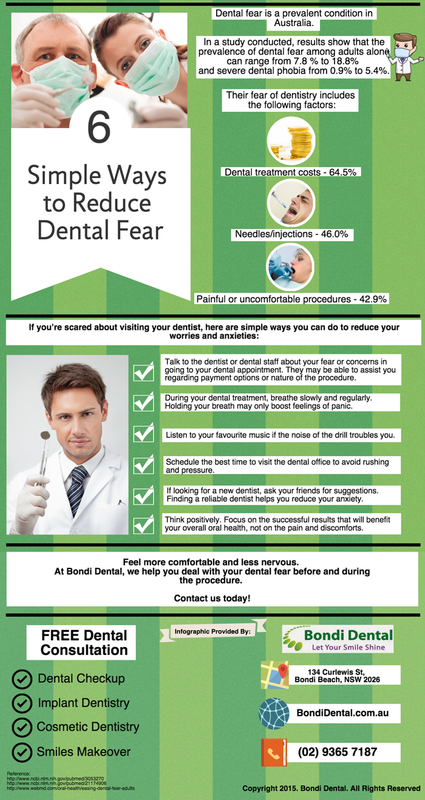 At Bondi Dental, we help you conquer your dental fears by means of encouraging support before attending to your treatment. Furthermore, we offer comprehensive oral care procedures to uphold the wellbeing of your dental and general health, giving your additional reasons to smile more and fear less about your dental checkups.